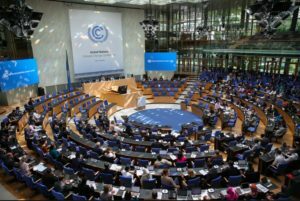 The United Nations global talks on climate change are known as meetings of the Conference of the Parties (COP) and there have been 23 such meetings to date. The COP meetings happen in different continents each year to enable countries to minimise their travel distances and also to expose delegates to the particular needs and circumstances of countries as they seek to combat the effects of adverse climate change. This year the COP was supposed to be held in Oceania, in particular Fiji. But of course Fiji was last year severely impacted by Cyclone Winston, the most intense cyclone ever recorded in the southern hemisphere, which killed 44 people and damaged or destroyed 40,000 homes. Accordingly, a decision was made to hold the COP in Bonn instead where infrastructural resources existed and where the intermediate meetings to the COP are normally held. So 10,000 people have rolled up to the early snowfall of a German November, not quite as attractive as a South Sea island! Technically, however the meeting is hosted by Fiji. One might think that having a conference chaired for the first time by a Small Island Developing State, combined with German organisational efficiency might be a good recipe for success. The jury is still out on this. One of the most disappointing aspects of this COP is the manner in which the main body of the conference has been separated from the negotiating venues. This has occurred before, most recently in Cancun, and has the effect of insulating the negotiators from the ‘nasty civil society types’ who hold their expositions, run their demos and generally provide the heart and soul of these meetings, a 15 minute bus ride from those politicians and public servants who are making their decisions behind closed doors. The informal contacts, the updates, the gossip – the things that make both sides appreciative of what the other is doing – these are certainly stifled by such a set up. For any COP ‘newbie’ the timetable is bewildering. The number of simultaneous events can approach 50. Choosing which to go to is a major operation each day and stamina is required to avoid being ‘brain dead’ after a few days exposure to a combination of academic, political and climate related organisations of various types. The small Irish group of Observers, about 10 in number, keep in close contact and alert each other to what is happening where and when. For this writer, the first day was marked by special meetings arranged firstly with an energy organisation concerned with demonstrating how current fossil fuel consumption trends were incompatible with compliance with the Paris Treaty. Of course, this was fairly widely known, but it was valuable to learn how important it is to stop oil and gas exploration now rather than lock the world into investments that will certainly deliver dangerous climate change. There is a lesson here of course for Ireland regarding the incompatibility of issuing new licences for the Porcupine Basin by the same government department that is charged with Climate Action. A briefing from the Director of Climate Action Network Europe was then arranged for the Irish group. This was both revealing and depressing. Ireland has been far from a leader in climate negotiations within Europe over the past few years, especially with reference to its 2030 targets. Instead, it has been looking for every concession possible to enable it to continue increasing its greenhouse gas emissions, projected by the EPA to occur until at least the middle of the next decade. There is no doubt that immense damage is now being done to Ireland’s international reputation, especially among developing countries and the more progressive European countries, by its identification as a climate laggard. The UK pavilion hosted a very interesting update on climate science since the last IPCC report 4 years ago. The clear message was that the IPCC were probably too conservative on many fronts, and while some of the worst case events sometimes touted as possibilities are unlikely to occur in the current century, there is cause for considerable concern, if not alarm as global temperature rise has returned with a vengeance in recent years. The main findings were that sea level rise is accelerating, climate models have not been underestimating temperature rise, and the earth’s climate is probably much more sensitive to greenhouse gas loading than the lower estimates sometimes surfacing in the literature. Health impacts have been much more prominently presented at this COP, especially the growing problem of Dengue fever and the deadly heatwave prognoses for many cities in the tropics, and some years later in the mid latitudes. This meeting ended with a special guest, the Minister for the Environment of the British Virgin Islands. On the 7th September Hurricane Irma visited and destroyed or severely damaged 80-90% of their buildings, 90% of their boats and brought sustained wind speeds of over 290 kph – speeds at which typical passenger aircraft achieve take-off! The highlight thus far for this writer was a high-powered panel discussion chaired by Mary Robinson. This featured Kevin Anderson of the University of Manchester, Christiana Figueres (Former Executive Secretary of the UNFCCC), John Schellnhuber of the Potsdam Institute and Johan Rockström of the Stockholm Resilience Centre. The theme of the meeting was simply the imperative of ‘bending the curve’ of global emissions downward by 2020 if we are to have any realistic chance of meeting the Paris objectives. Professor Anderson’s title was “Beyond Nebulous Arm Waving” a very appropriate hard hitting talk which brought home to many the urgency of the problem we face and the folly of relying on accountancy tricks to buy time. The reality that we have 600B tonnes of carbon left to burn was emphasised as the stark reality by Prof Schellnhuber – something pointedly ignored by most national negotiators here because it raises deep political problems they would rather not confront. As the main scientific advisor on Pope Francis’s seminal encyclical Laudato Si, Prof Schellnhuber frequently quoted from it, as did the other participants. The most important first step on the road to decarbonisation was generally agreed to be tackling energy subsidies. The world subsidises fossil fuels to the tune of $500 Trillion per year. Irish taxpayers also do their bit with subsidies for peat! Would that this, or even a fraction of this, was spent on renewable energies for the sake of the next generation! The middle of the second week at COP is when the big names arrive. Prior to this it is the officials who have been spending long days and night poring over the negotiations, hoping to present their political masters with the groundwork largely done and enabling the Ministers to complete the last lap and claim the glory. Naturally, there was a buzz around the place yesterday as the conference awaited the arrival of Angela Merkel and Emmanuel Macron. In many way they represent global leadership on this topic now that the US has opted out of a significant role. For the German audience, Merkel was honest about the difficulties faced in forming a new government and reconciling climate and other priorities. Germany has achieved considerable progress on its target of reducing emissions by 40% compared to 1990, with a current figure of just over 30%. But the practicalities of ceasing lignite burning, especially in the east, remains problematical. Macron on the other hand was very willing to accept the mantle of leadership on this topic, pledging that France would pick up the tab for the funding of the IPCC to make good any shortfall resulting from the US failing to pay its share. Indeed he made some other interesting points which have not really been picked up by the press, most notably raising the issue of ‘border taxes’ in any future trade deal involving countries not including their carbon costs in their exports. The high level segment continues today, working its way through the 195 countries whose Head of State, Head of Government or Minister each has 3 minutes to say how wonderful they are. Minister Naughten will have a difficult task. Early yesterday the Climate Change Performance Index was published. This ranks 56 countries in terms of their progress in limiting emissions, progressing renewable energy plans and the effectiveness of their policies in this area. Ireland, which has been as high as 11th in former years, has now slid down the table to 49th place, behind countries such as Poland and Turkey. Indeed Ireland is now the worst performing country in Europe in the Index, largely because of its impending failure to meet its international obligations and the lack of compatibility of its efforts with the Paris targets. Increasingly the Irish people here are being asked by Developing Countries, some of which have been ravaged by cyclone damage in recent months, why Ireland is not pulling its weight in tackling its emissions responsibilities. But of course we know the answers! 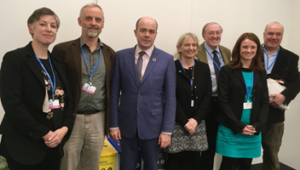 Sadhbh O Neill (UCD), Phil Kearney (An Taisce), Minister Naughten, Finola Finnan (Trocaire), John Sweeney (An Taisce), Cliona Sharkey (Trocaire), Ian Lumley (An Taisce). The small Irish civil society group met Minister Naughten for half an hour yesterday and raised several issues with him. While a positive atmosphere prevailed, the vision to take radical action in areas such as ceasing issuing oil exploration licenses, tackling agricultural emissions, or adopting a leadership position in the ongoing EU discussions on 2030 targets was less than hoped for. One option though that we think worth pursuing was to highlight the unique nature of the Climate Assembly as an exemplar of good practice at COP24. We have heard a lot at this COP from the Fijians about what they call the Talanoa Dialogue. Talanoa is a traditional word used in the Pacific to reflect a process of inclusive, participatory and transparent dialogue. In many ways the Citizens’ Assembly mirrors this. Of course it would be important that Ireland’s version also involves implementation if we were to successfully export it! Today the main decisions will begin to emerge. They will not be radical this year as the effort is mainly to establish the rule book for Paris to commence in 2020. But the extent to which the much lauded increased effort pre 2020 is translated into meaningful actions will be the key output to watch. Negotiations are frequently a war of attrition, and previous COPs have long over run their intended closing time on the Friday of the second week. The imperative of catching trains and planes sometimes gives a sense of urgency that is lacking earlier. On the final day here in Bonn, various press conferences were postponed and then cancelled, a sign that negotiators were still trying to bash out something concrete from a meeting that overall lacked the potential for a headline announcement. It was after all mainly designed to further the rule book for the Paris Agreement to ensure that the various pledges made would be starting from a level playing field and capable of being measured and monitored, and not simply aspirational. Accordingly, as some of the 13,700 participants began dismantling their stands and packing up, the talking continued into the night. So what was the outcome of this, the largest ever conference held in Germany? The most important outcome was largely due to the determination of the Fijian chairmanship. In Fiji a practice of constructive and transparent discussion and debate exists around important issues, prior to reaching decisions. This is known as a ‘Talanoa Dialogue’. The delegates agreed to use this process to examine ways of increasing their pre 2020 efforts over the coming year. This reflected a major concern of the conference that waiting until 2020 to take stronger action could be fatal to the objectives of the Paris Agreement. Fiji and the next President, Poland, will work together on a pre-2020 stocktake, in effect signalling the need for new pledges before the Paris starting date. This has implications for EU countries currently finalising their 2030 targets in that they will probably be redundant soon and require further tightening. Of course it remains to be seen how countries failing already to cut their emissions, such as Ireland, will react to what is now recognised as an urgent matter. Global emissions resumed their upward trend last year and carbon dioxide concentrations in the atmosphere jumped to over 403ppm, a level not seen for 3M years. The second highlight was the coming together of 25 countries, states and regions to form the ‘Powering Past Coal Alliance’. Led by the UK, Canada, France, New Zealand and Mexico this group committed to ending unabated coal power generation and committed to no further investments in their jurisdictions or abroad. In the case of the UK the end comes by 2025. Interestingly, Germany has not joined the club yet and continues to face problems in meeting its 2020 target of a 40% reduction largely due to the legacy of lignite burning in the former East Germany. For this it received the ‘Fossil of the Day’ award. (The overall ‘Collossal Fossil’ of course went to the USA.) Chancellor Merkel made only a passing remark to this in her address; but in fairness Germany is already close to a 30% reduction, something Ireland is nowhere near achieving for the next decade under its present policies. Some countries went further than limiting their attention to coal. France has declared a moratorium on all new hydrocarbon licences. There is already enough economically available gas and oil in currently operating fields to exceed the Paris targets. The same Department in Ireland that is responsible for Climate Action is also responsible for issuing exploration licences for the Porcupine Trench. Perhaps it is time Ireland recognised that ‘so called’ energy security at the expense of global insecurity should be reconsidered. Other agreements centred around agriculture, gender and the rights of indigenous peoples. The Government of Norway for example announced a $400M fund to support more efficient agriculture, smallholder farmers and sustainable forest management. 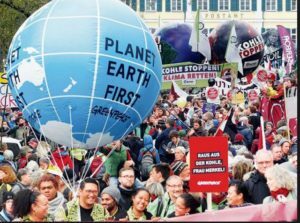 The disappointments of the conference largely centred on the reluctance of the developed world to deliver on their financial commitments to the Green Climate Fund. For the most part they turned up empty-handed or with minimal offerings. This was particularly hard for the many small island states devastated by hurricane damage over the past year who sought funding under a ‘Loss and Damage’ argument. For them, climate change is real and life threatening now, not at some future date. A further opportunity for the Developed World to show the colour of their money comes with President Macron’s international climate summit next month in Paris, but the omens are not that encouraging. Some of the wrangling this year centred on middle income countries such as Turkey wanting to have access to such funds. In truth, however, when the conference heard of the evacuation of Barbuda and the poignant report of the Minister from the British Virgin Islands, it was clear where the Principle of Common but Differentiated Responsibilities should lie. There was some good news from the conference. Federal Environment Minister Barbara Hendricks reported that it came in on budget (€170M) and was the first UN Climate Change Conference to receive official certification for eco-friendly performance. Renewable energy expansion around the globe is accelerating at a fast speed, doubling every 5.5 years and on target to achieve complete decarbonisation of the energy sector by 2050. Michael Bloomberg announced he was contributing $50M into the fight against coal internationally. Indeed the US was present in a constructive role, mainly represented by individual states, governors and business leaders. It is quite clear that whatever President Trump does to try and derail the UNFCCC, the US will meet its Paris pledges anyway. This is a clear sign that the fossil fuel age is coming to an end and businesses are recognising new opportunities as the world, though not including Ireland – now Europe’s worst performing country – decarbonises. 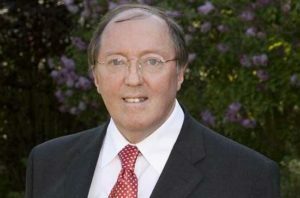 John Sweeney is Professor Emeritus, Department of Geography, National University Ireland, Maynooth, where he taught from 1978. He received a First Class Honours B.Sc. from the University of Glasgow in 1974 and was a awarded a PhD also from Glasgow in 1980. Over the past 30 years he has published approximately 60 scientific papers and edited/co-authored 4 texts on various aspects of climatology and climate change in Ireland. He has served a number of national academic societies as President, Secretary and Treasurer as well as being the Irish representative on a number of European academic bodies. He currently leads a number of nationally funded research projects examining various aspects of climate change in Ireland. Professor Sweeney contributed to the reports of the Intergovernmental Panel on Climate Change, which was awarded the Nobel Peace Prize in 2007. John is currently President of An Taisce, the National Trust of Ireland.